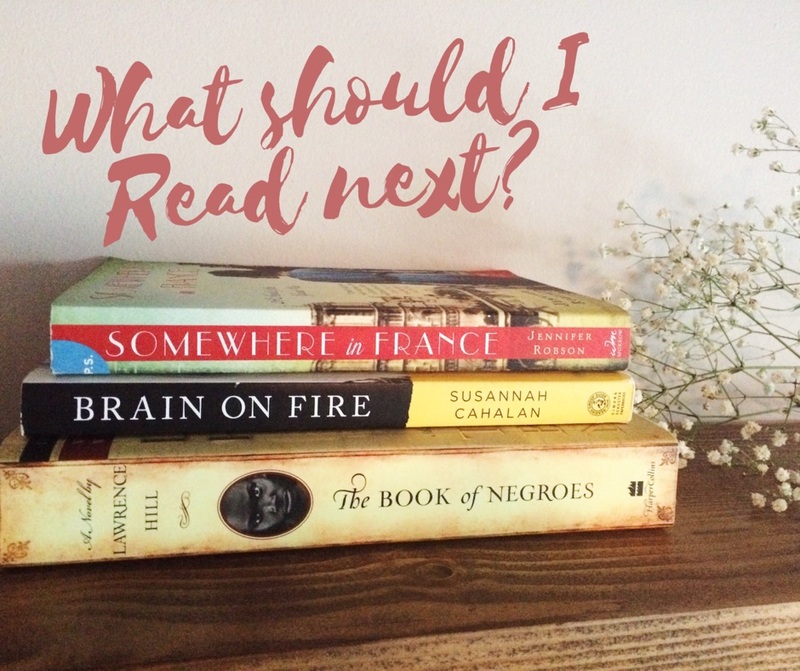 Inspired by Anne Bogel's podcast What Should I Read Next?, Sara sent me 3 books she loves, 1 book she hates, her current reads, and then I suggested 3 books she should read next. Now we're switching roles! This book is about a woman who is forcefully brought from Africa to the United States at the time of the American Revolution. She arrives in America as a slave, but this is a story of how she forges her path to freedom. To me this is such a perfect book. I love historical fiction, especially from the 19th and 20th century, and this book has always stayed with me. Hill's writing is fantastic, and the story pulled me in from the very beginning. I read Brain on Fire last year and was totally fascinated by Susannah's story. She was only 24 when she woke up in a mental institution missing one month of her memory. She was labeled as psychotic, violent, and as a flight risk. Why? What happened? Her memoir tells about how she descended into madness, the life-saving diagnosis that nearly didn't happen, and how she struggled to reclaim her identity. I love a good memoir, and as long as I live I will never forget this story. It's scary and heart-wrenching, yet you know the ending will somehow be okay because Susannah is telling her own story. 3. Somewhere in France by Jennifer Robson. This book is about a young woman who works as an ambulance driver during WWI. She is in love with her brother's best friend who works as a doctor on the front lines. I've already said that I love historical fiction, and Jennifer Robson's books are all set around the time of WWI and are extremely well-researched. Plus I've been reading a lot of romance novels lately, and the love story is definitely a central element of the plot. You can totally judge this book by its cover. It's wonderful! Allegiant by Veronica Roth. This book was terrible. I loved Divergent, but this was such a disappointing ending to the series. I was so angry and confused with how Four's character is knocked down at every turn in this book and, without spoiling the ending, the choices the author made on how to end this book made me ugly cry in the very worst way. I don't mind plot twists or emotional endings, but I feel like a lot of it in this book was done for shock value, and that doesn't make for a good story. Unfortunately, it made me completely lose trust with this author. I can only read one book at a time, so I'm currently reading Garden Spells by Sarah Addison Allen. I'm only a few chapters in, but I really enjoy it so far. A wonderful story about friendship, family, and love with a dose of magic in the form of a sacred garden. It reminds me of the book The Language of Flowers by Vanessa Diffenbaugh, which I also really enjoyed. The book I read before Garden Spells was Fresh Brewed by Pamela Ford. I have a full review coming soon to the blog, so I won't give away too much, but this was extremely fun chick lit, and I totally loved it. So, Sara.....What should I read next?! Let me start off by saying that I love your choices! I have read The Book of Negroes (and it's one of my all time favourites to be honest. I almost had it on my list too), but I haven't read the other two, although I will be adding Somewhere in France to my list now! Like me, it seems like you also enjoy reading about strong female characters, and from your selections, you also appreciate women who persevere through adversity, in both fiction and non-fiction. I haven't read a lot of non fiction, but I have found myself becoming more open to it lately. So, without further ado-my recommendations!! I picked this for you because it is a work of historical fiction based on the life of Josepehine Bonaparte-the first wife of Napolean Bonaparte. It is in epistolary format-diary entries- and gives you a (fictional) sneak peak into her life from 1777 (at the age of 14) to her marriage to Napoleon in 1796 at 32 years old. It's been quite some time since I read this book, but I absolutely loved reading about this time period, especially in the format of diary entries. I can only imagine what life must have been like for Josephine, and have so much respect for what women had to go through to make their way in life at that time. One of my favourite things about this book-it's the first in a trilogy (book 2 Tales of Passion Tales of Woe, and book 3 The Last Great Dance on Earth). This is another historical fiction novel, this time alternating between Trudy, an American woman in present day Minnesota, and her mother Anna's experience as a German woman during the Holocaust. As I had mentioned in my first post to you, I love reading books set in this time period, and this one is different from most I have read because Anna's experience is as a German non-Jewish woman, not someone who was targeted by the Nazi party as well as her eventual relationship with an SS officer. It is a story that I think we can both relate to as mothers (although when I read it I was not yet a mother). Imagine if YOU were living in Germany at that time, as a single mother, trying to take of your child. What would you have done (and what would you do) to keep your child safe? An emotional read for sure, but well worth it. OK this one is NOT historical fiction! As I mentioned, I'm not much of a non-ficiton reader, but because one of your top books was a memoir I really wanted to include one for you! I will preface this by saying that this is not my favourite book, but, based on what you like about Brain on Fire, I feel like it could be the book for you (although it does feel weird to recommend something I didn't love). A House on Fire is Lindhoutt's memoir from growing in up in Sylvan Lake Alberta, to becoming a world traveler, and eventually a journalist, who is kidnapped and held hostage in Somalia (for 460 days!). I feel bad saying this, but I was rather unimpressed with Lindhoutt's attitude, and travelling choices she made, however in retrospect, I truly admire her ability to be candid about her motivations and decisions. Her experience as a hostage will show you the many ways one can be strong in the most dangerous of situations. It is also scary and heart-wrenching, however as with Brain on Fire, we know the author survives as she is the author of the book- but not only does she survive- she is stronger for it. It was interesting to read about how this experience has shaped Lindhoutt, and her decision to choose forgiveness or bitterness, and actually founded the Global Enrichment Foundation, an organization established to provide university scholarships to Somalian women. So Jenn-Have you heard of any of these books? Read any? What do you think? What will YOU read next!! Thank you so much for these suggestions, Sara! I haven't read any of them, and they totally sound like they are each right up my alley. 1. The Many Lives and Sorrows of Josephine B. I have a weakness for French history and trilogies, so I'm adding this to my reading list immediately. I also love books that are written in letters or diary entries and haven't read one in awhile, so I'm sure I will love this. 2. Those Who Save Us I feel like this book will make me cry something fierce, but I will certainly still read it. Anything about parents protecting their children always gets me, and I do love historical fiction from this time period. 3. A House in the Sky This is the one book of your recommendations I have seen before. I haven't read it yet, but I remember when her story came out. It sounds like a very harrowing experience. I think next chance I'll get, I'll pick up Those Who Save Us and give it a try (with a pack of Kleenex nearby). I kind of feel like suggesting it as my next pick for our book club. If I'll going to read it, I need others to cry along with me! *If you missed part 1 of this post from last week, you can find it here. Then be sure to check out Anne Bogel's podcast, What Should I Read Next? Am I Not Really A Mother?